The boarding pass arrived this week for the London preview of Pan Am, a drama series landing on BBC2 later this year. Taking off on ABC in America tonight (Sunday). With the opening episode shown to a group of British journalists, including me, last Wednesday evening. Update: Pan Am starts at 9pm on Wednesday Nov 16 with the second episode at 9:45pm. My story on the series is below, followed by my transcript of our post-screening transatlantic chat with series creator and executive producer Jack Orman. Who had some interesting things to say about the process of bringing Pan Am to the screen. It’s a visually glossy and gorgeous show that expertly taps into the excitement of the 1960s’ jet age. Promising to bring some much needed escapism into recession-hit homes – having been sold to over 100 territories around the globe. It won’t win any awards for heavy duty drama. But after viewing this “pilot” episode, I certainly wanted to see more. If nothing else it will certainly bring some sparkle, fun and the odd Martini to those dark winter nights. FASTEN your seatbelts for a high-flying new TV drama leaving easyJet and Ryanair in its slipstream. Hollywood actress Christina Ricci is one of the stars of Pan Am, set in the glamorous jet age of 1963. She plays purser Maggie Ryan in the days when stewardesses were on the cover of Life magazine and Martinis flowed at 35,000 feet. Landing on BBC2 later this year – and in America this Sunday – Pan Am will also feature the 1964 “British Invasion” as the iconic airline flew The Beatles to America. It claims some Pan Am stewardesses – “a new breed of woman” – were recruited as spies by British intelligence during the Cold War. He said The Addams Family, Sleepy Hollow and Grey’s Anatomy star Christina, 31, was more than ready for take off. 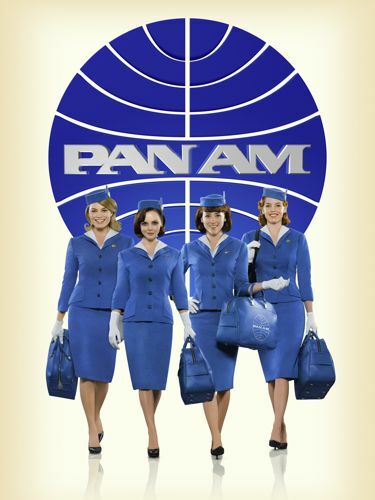 Sold to over 100 countries, the production secured the rights to use the classic Pan Am logo and name. Originally known as Pan American Airways, the airline went out of business in 1991 after turbulent business losses. It was also the target of terrorists, including Pan Am Flight 103 in December 1988, destroyed by a bomb over Lockerbie in Scotland, killing a total of 270 people. “The show started with Sony and Sid and Nancy Ganis getting the rights to the name and logo for Pan Am. And they called me pitching a show which was essentially Pan Am stewardesses in the Sixties. I stopped that after about 30 seconds and said, ‘What do you mean? You want to do a global period exterior show?’ And they said, ‘Yes.’ And I said, ‘You’re crazy and I’m in.’ It was a lot of fun from the very beginning. “My job was to really contain it more than anything else. As you know, Pan Am was an international airline and so we were going to fly all over the world. And I specifically wanted to set it in a time period where the world was about to change drastically. The first commercial transcontinental flight for Pan Am was in 1958, launching what we refer to as the jet age, which then became a symbol of a forward thinking pioneering spirit. And I decided to set the show in 1963 because change was in the air. In America we had a changing of the guard, a changing of a generation in government and the pot was about to boil over socially and politically. The Sixties as we know it came a little later in the decade, so we can really transform the show, if it’s a success, over a significant time of change. What was the most difficult piece to find? “When I wrote ‘brand new Boeing 707’ it didn’t occur to me that they don’t exist anymore. And you can’t just build one. There was part of that plane set that was old fashioned carpentry and a lot of it was restoring it. We had to have different pieces…we were in the Mojave Desert looking at scrap pieces of galley and cockpit. That’s a real cockpit, that’s real pieces of galley. And it was more of a refurbishment than a build. That was a big undertaking and thank God we went to series because we had to do that for the pilot and we just kept it for the series. “One of our executive producers, Nancy Hult Ganis was a Pan Am stewardess. Her time was a little bit later in the late-Sixties. But she arranged for me to meet with 20 stewardesses of that era all at one time up in San Fransisco. And I had an afternoon session with these ladies. After about 20 minutes they started to loosen up and tell me stories and contradict themselves…just go back to just a wonderful time in their lives. So that added a lot of texture and interesting nuances of what the job was really like, from them. And then I did the same with the pilots. I had a whole afternoon with a bunch of former Pan Am pilots of that era. Then we did specific research once I’d wrote the story. Did they feel like “a new breed of woman” as in the first episode? Anything in research that particularly shocked or surprised you about this era and Pan Am at this time? “What was interesting to me really is that they got jet travel right the first time. In 1958 they did this first transcontinental from New York to Paris and it’s about the same time it takes to fly now. They (BA / Air France) did the Concorde but that didn’t really pan out as a commercial enterprise. And they went bigger with the 747s but they eventually came back down to the size of planes they used in the early Sixties. So it was really quite stunning. There weren’t that many crashes early on and the switchover from prop planes to jets, commercially, was pretty smooth. Is there any evidence that Pan Am air hostesses were recruited as spies by the British security services? Good time to launch this show against the backdrop of a recession? An escape to a more glamorous era? Will that be one of the attractions? How tempt Christina Ricci to this project? Bay of Pigs is featured in the first episode. What other historically significant events can we expect to see later in the series? “In the third episode, we set our show around Kennedy’s trip to Berlin in June of 1963. His ‘Ich bin ein Berliner’ speech. “We touch upon the Mercury 7 launch, the final launch of the Mercury programme. We touch upon Martin Luther King’s civil rights speech. We have an episode in and around Rome…so we do have these brushes with history, which is a lot of fun. Especially because we’re a global show. What we’ve been trying to do is, again, approach them from our specific characters’ point of view. And their mindset at the time. They could be wrong. Small references – Ted’s attitude about Castro in 1963 that he’s never going to last. That was the sentiment at the time but clearly not the case. You have an exciting soundtrack? The look of the show? How do you reflect on what eventually happened to Pan Am? Posted in News and tagged Christina Ricci, Jack Orman, Pan Am. Bookmark the permalink. It wasn’t bad. First episodes drag a bit sometimes, to get all the backstory in for the new characters but it was worth giving it a chance so i’ll keep watching. I wonder if they’ll also touch on the guy, Frank Abagnale, who, at the age of 16 pretended to be a Pan Am pilot and scammed them for 2 years, getting himself on flights and in posh hotels all over the world. Di caprio played him in Catch Me If You Can. it would be fun to have this recurring character pop up getting a “deadhead” ride and flirting with the girls, and later, finding out that he’s a fake pilot! I am looking forward to The Beatles’s episode,can anyone tell me when that will air? Also which Beatles’s Tribute Band is going to play The Beatles,I have a few suggestions & they are as follows. Will I hope you all can use my ideals of which Beatle Tribute Band to use,if it were up to me it would be between 1964 The Tribute & Liverpool Legends. Thanks for letting me express my feelings.